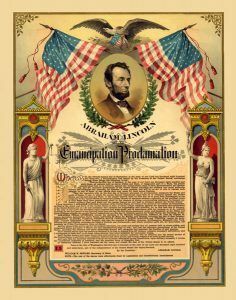 Although the Emancipation Proclamation did not end slavery in the nation, it captured the hearts and imagination of millions of Americans and fundamentally transformed the character of the Civil War. After January 1, 1863, every advance of federal troops expanded the domain of freedom. Moreover, the Proclamation announced the acceptance of black men into the Union Army and Navy, enabling the liberated to become liberators. By the end of the war, almost 200,000 black soldiers and sailors had fought for the Union and freedom. Abraham Lincoln. Click for prints & products. The original of the Emancipation Proclamation of January 1, 1863, is in the National Archives in Washington, D.C. With the text covering five pages the document was originally tied with narrow red and blue ribbons, which were attached to the signature page by a wafered impression of the seal of the United States. Most of the ribbon remains; parts of the seal are still decipherable, but other parts have worn off. 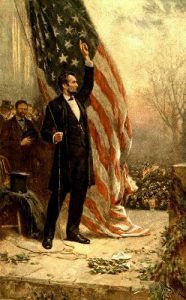 Lincoln signed his Preliminary Emancipation Proclamation on September 22, 1862, stating that all slaves would be free in the rebellious states if the rebels did not end hostilities and rejoin the Union by January 1, 1863. 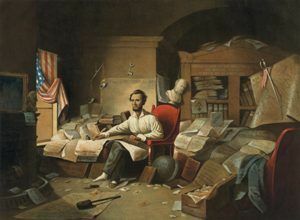 President Lincoln writing the Emancipation Proclamation, by David Gilmour Blythe,1863. Click for prints & products. Arkansas, Texas, Louisiana, (except the Parishes of St. Bernard, Plaquemines, Jefferson, St. John, St. Charles, St. James Ascension, Assumption, Terrebonne, Lafourche, St. Mary, St. Martin, and Orleans, including the City of New Orleans) Mississippi, Alabama, Florida, Georgia, South Carolina, North Carolina, and Virginia, (except the forty-eight counties designated as West Virginia, and also the counties of Berkley, Accomack, Northampton, Elizabeth City, York, Princess Ann, and Norfolk, including the cities of Norfolk and Portsmouth), and which excepted parts, are for the present, left precisely as if this proclamation were not issued.